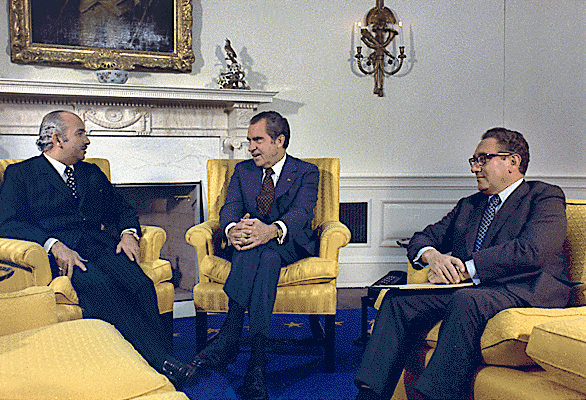 Meeting in the Oval Office between Nixon, Henry Kissinger, and Egyptian Foreign Minister Ismail Fahmi. 31 October 1973. Richard Nixon Presidential Library. Recently, President Trump has offered to serve as a mediator between Arab states in the Gulf and Qatar over their increasing tensions. The President could learn a lesson from his predecessors about handling issues in the Middle East among rivals. As President, Richard Nixon and his Secretary of State Henry Kissinger worked hard to ease tension between Arab countries and Israel, culminating in a tour through the region in June 1974. The accomplishments made then were not easy, but their successes would pave the way forward for decades of Middle East policy. President Nixon strongly supported the state of Israel in the Yom Kippur War, giving it military aid while under attack. As the war came to a close, the Nixon administration decided to take a new approach to Arab states that had previously been in the Soviet corner of international politics. The U.S.-Egypt friendship that would form from this new tactic would last for decades and overlay a path for Israel and Egypt to make peace in the future. Jordan had slowly leaned towards U.S. friendship since the early Nixon years as Palestinians sought to overthrow King Hussein. Further material aid strengthened after Jordan did not attack Israel in the October War. Syria, perhaps the most jaded of the warring states, had received Nixon and saw a reopening of formal relations with the U.S. that had been closed for some time. In all these cases, the US created incentives for the Arab states to reconsider their posture towards Israel, the U.S., and even the Soviet Union. These incentives often came in the form of aid, and land for peace. Egypt received assurances on returning occupied land, while Jordan received military supplies and Syria’s relationship with the U.S. was improved. Most of these relationships would further improve past Nixon’s presidency while keeping a strong relationship with Israel. In the documents below we see that the Nixon administration clearly emphasized relationships between the Arab states and the U.S., as well as securing a stable ceasefire. Many presidents; past, present and future, could learn from their predecessor that creating incentives for the states helps improve relations and allows for fierce rivals to slowly come to peace. Saunders, Harold H. 1973. Visit by Deputy Egyptian Foreign Minister Ismail Fahmi, November 1973. National Security Council Middle East Negotiation Files. NSC 1178. Yorba Linda, CA: Richard M. Nixon Library. Kissinger, Henry A. et. al. 1974. Memorandum of Conversation, Tuesday, July 9, 1974. Memorandum, HAK 129. Yorba Linda, CA: Richard M. Nixon Library.